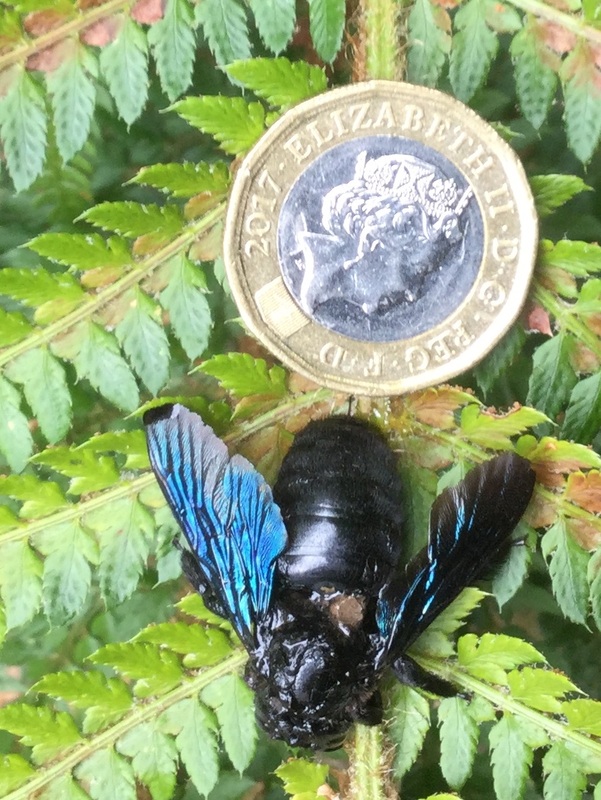 I've been forwarded photos, and just yesterday two specimens, of Violet carpenter bee, from allotments on the edge of Exeter. I'm assuming X violacea. Does anyone know of any other UK records this year? The allotment holder reported the bee buzzing around her allotment throughout July. The two specimens found yesterday were picked up from her garden nearby. If the record is of general interest I can find out some more details. Hello Stephen - a couple of records (this year and last) of Xylocopa sp. in Liverpool (it may even have been confirmed as X. violacea, can't recall). Same place so might indicate a successful overwintering but without explicit evidence of the nest.......................a few years ago a male was in a Preston garden in late summer (v. near to Preston Docks) but I'm not aware of any more recent records. In 2017 someone contacted me with a photo of violet carpenter from somewhere in taunton. But not heard of others.